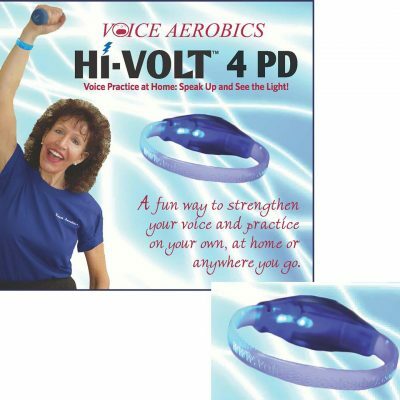 Voice Aerobics® is a 3-part whole body voice strengthening program developed in 1999. It was originally created as an after therapy program for persons with speech and voice changes from Parkinson’s disease, including patients who had completed formal therapy programs, but who failed to retain the improvements or changes in their voice. Participants appeared to benefit from a weekly class which focused on: breathing, movement, and voice using a “whole body” approach. The class was recorded on a DVD in 2008, and has since been available for independent use by anyone experiencing voice weakness or changes from diseases, disuse or age related changes. 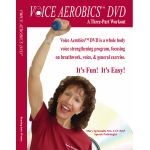 Part 1 of the Voice Aerobics® DVD, Breathwork©, is only 15 minutes long, and provides guided practice with focus on posture, diaphragmatic breathing, and resonant voice. Breathwork© has been used successfully as a warm-up program for patients with voice problems resulting from increased muscle tension or voice misuse, muscle weakness disorders or for persons with voice changes from restricted breathing patterns. Because the warm-ups are guided, patients often comment that one of their favorite features of the program is that there is “nothing to remember,” allowing them to simply focus on: posture, breathing, and voice. Even busy teachers or business professionals with voice impairments have reported that they find it helpful to “tune out” from life’s stresses for 15 minutes a day, and “tune in” to Breathwork©. The contents of this video download are protected by Federal Copyright Laws. 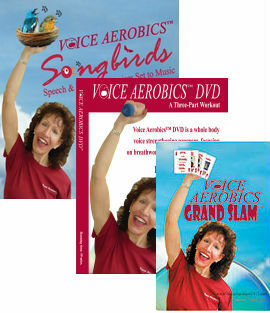 You may not copy, share or distribute this video without the written consent of Voice Aerobics®. After check-out, you will receive an e-mail with download instructions. If you have an account with VoiceAerobicsDVD.com, you can download the video by clicking on “My Account” at the top, then clicking the “Downloads” link on the left.